For the footballer, see Bob Mortimer (footballer). For the evangelist, see Bob Mortimer (evangelist). Robert Renwick Mortimer (born 23 May 1959) is an English comedian, podcast presenter, and actor. He is known for his work with Vic Reeves as part of their Vic and Bob comedy double act. Mortimer was raised with three brothers in the Linthorpe area of Middlesbrough. His father, a biscuit salesman, died in a car crash when Mortimer was young. Mortimer attended Acklam High School on the site of Acklam Hall in Acklam, Middlesbrough. His schoolmates included Ali Brownlee, who would go on to become a sports presenter on BBC Tees. He trialled for local professional football club Middlesbrough. Although he was not able to join the club as a professional due to arthritis, he still supports them. He left school with three A-levels and went on to study law at the universities of Sussex and Leicester. There, Mortimer became involved in political causes and the punk movement, starting a band called Dog Dirt. After leaving university with an LLM in Welfare Law, Mortimer moved to London and became a solicitor for Southwark Council. He then moved to a private practice. In 1986, Mortimer went to the Goldsmith's Tavern in New Cross, London to see a new show by a comedian called Vic Reeves. Mortimer was impressed by the performance, particularly the character Tappy Lappy, which was Reeves attempting to tap dance while wearing a Bryan Ferry mask and planks on his feet. Mortimer approached Reeves after the show, and the two began writing material for the next week's show together. They also became good friends, even forming a band called the Potter's Wheel. Mortimer began to perform on the show, which was christened Vic Reeves Big Night Out, creating such characters as the Singing Lawyer, Graham Lister, Judge Nutmeg and the Man With the Stick. The show became very successful in South London and eventually outgrew Goldsmith's Tavern, moving in 1988 to the Albany Empire in Deptford. Mortimer soon became an integral part of the performance, providing him with a weekly break from the legal work, which had begun to disillusion him. He once quipped that the final straw was a run in with a mugger who, recognising Mortimer as having represented him legally, promptly stood down and apologised for not recognising him. Reeves and Mortimer made their television debut on the short-lived 1989 comedy chat show One Hour with Jonathan Ross, in the game show segment known as knock down ginger. Later that year, the duo made their first television pilot together, Vic Reeves Big Night Out in late 1989. The television show remained true to the nightclub act's variety show format. Mortimer took a 10-week break from his legal job to film the series and never returned. The two later created a one-off pilot for a sitcom called The Weekenders in 1992, followed by the sketch show The Smell of Reeves and Mortimer in 1993 and Shooting Stars, a comedy panel show that first aired in December 1993. After being commissioned, Shooting Stars ran for five series between 1995 and 2002, with a special anniversary edition broadcast in December 2008. A sixth series was broadcast in late 2009, followed by a seventh series in mid-2010, and eighth in 2011. In 1999, Reeves and Mortimer appeared in a second sketch show called Bang Bang, It's Reeves and Mortimer. A year later, Mortimer played the part of Jeff Randall in Randall & Hopkirk (Deceased), opposite Reeves as Marty and Emilia Fox as Jeannie Hurst. In 2003, Mortimer and Reeves were listed in the Observer as one of the 50 funniest acts in British comedy. In a 2005 poll to find the Comedians' Comedian, the duo were voted the 9th greatest comedy act of all time by fellow comedians and comedy insiders. On 17 November 2007, Mortimer appeared as Reeves' hairdresser, Carl, in the weekly radio sketch show on BBC Radio 2 entitled Vic Reeves' House Arrest. On 27 February 2008, Reeves announced that he and Mortimer were working together on a new sitcom about super heroes who get their powers through a malfunctioning telegraph pole. In November 2013, Reeves and Mortimer filmed episodes of a new BBC sitcom, House of Fools, also featuring Matt Berry (as Beef), Morgana Robinson (as Julie), and Dan Skinner (as Bosh). In October 2015 the pair cancelled the first leg of their live tour, 25 Year of Reeves and Mortimer: The Poignant Moments, after Mortimer underwent an emergency triple heart bypass. On 29 December 2017, Mortimer and Reeves starred in a relaunch and new singular episode of their comedy Big Night Out for the BBC. The show has been remade and subsequently renamed to Vic and Bob's Big Night Out. The episode remained true to the classic Big Night Out formula and was composed of various comedy songs, skits, characters and sketches. This was the first time the Big Night Out series had featured Mortimer's name in the title. A full series of Vic and Bob's Big Night Out began on BBC Four in November 2018. In 1997, in collaboration with Chris Rea, Mortimer recorded Rea's hit "Let's Dance" with his favourite football team, Middlesbrough. The single reached No. 44 in the UK charts. In 1996-97, Mortimer appeared on an episode of Mash and Peas with Matt Lucas, David Walliams and Reece Shearsmith, in a sketch spoofing Seinfeld, called I'm Bland... yet all my friends are krazy!. In July 2002, Mortimer fought and defeated Les Dennis in the BBC's first Celebrity Boxing match, as part of Sport Relief 2002. In 2002, Mortimer presented the Channel 4 list show The 100 Greatest World Cup Moments of All Time! An updated show, again hosted by Mortimer, was broadcast by the channel in 2010, to coincide with the 2010 FIFA World Cup. Mortimer produced and presented the second match, The Fight, a year later, which saw Grant Bovey versus Ricky Gervais. In 2005, Mortimer hosted his first major TV series without Reeves, a comedy panel game for BBC One, called 29 Minutes of Fame, which featured regular guests such as Jo Brand. Also in 2005, Mortimer voiced the character of Father Nicholas in the animated BBC Three series Popetown. The show was not broadcast by the channel, for fear of offending Catholic viewers, though it saw a DVD release later that year. Mortimer co-wrote the BBC Three sketch comedy Tittybangbang with Jill Parker. The programme starred Lucy Montgomery and Debbie Chazen, with Tony Way, and ran for three series between 2006 and 2007. Mortimer appeared on BBC Two's Never Mind the Buzzcocks on four occasions – in 1996, on Sean Hughes' team; in 2000, on Phil Jupitus's team; in 2008, as a guest team captain; and in 2012, as a guest host. In April 2010, Mortimer appeared on the Sky1 panel show A League of Their Own, on Andrew Flintoff's team. Mortimer is now writing his first novel, provisionally titled "Have Her Over My Hedge (You've Never Trimmed It)", with Charlie Higson. Mortimer is currently[when?] writing a sitcom for the BBC starring Mackenzie Crook and Iain Lee. Mortimer has been a regular guest panelist on the BBC1 quiz show Would I Lie to You? since 2012, appearing in episodes broadcast in May 2012, June 2013, September 2014, August 2015, September 2017, December 2017, May 2018 and October 2018. Also in 2013, Mortimer starred as Frank in the E4 comedy Drifters. On 18 June 2014, Mortimer appeared on an episode of the Dave show Alan Davies: As Yet Untitled. On 4 March 2015, he appeared in Let's Play Darts but lost out to Roisin Conaty. In April 2015, Mortimer took over from the late Rik Mayall as Bombardier Bedford, the mascot of Well's Bombardier Beer. Since March 2016, Mortimer has co-hosted a regular podcast, Athletico Mince alongside Andy Dawson. Mortimer has appeared on numerous episodes of the Sky1 comedy panel game Duck Quacks Don't Echo. In 2017, Mortimer competed in and won series 5 of Taskmaster against Aisling Bea, Sally Phillips, Nish Kumar and Mark Watson. In 2017, Mortimer competed in the Taskmaster: Champion of Champions series Taskmaster against Noel Fielding, Josh Widdicombe, Katherine Ryan and Rob Beckett, coming last. At around the age of 7, Mortimer accidentally burnt down his family's home with a stray firework. He suffers from rheumatoid arthritis, which gives him great pain when he is stressed, especially before making a television series or embarking on a tour. On those occasions, he controls the illness with steroids. In October 2015, it was revealed that he was recovering from a triple bypass surgery which led to the cancellation of the first leg of the Reeves and Mortimer 25 years tour. Mortimer married his partner of 22 years, Lisa Matthews, in October 2015. The couple have two children, Harry and Tom. On 11 December 2017, on the comedy panel show Would I Lie to You, Mortimer revealed he had practised some of his own dentistry for the past fifteen years. He also has professional experience as a hairdresser. He is a lifelong fan of Middlesbrough Football Club and the rock group Free. ^ Herring, Richard. "Episode 64 - Bob Mortimer". Richard Herring's Leicester Square Theatre Podcast. comedy.co.uk. Retrieved 17 June 2015. ^ Ewing, Sarah (4 February 2018). "Bob Mortimer: 'I wrecked the family fortunes by burning down mum's uninsured house'". The Telegraph. Retrieved 12 April 2019. ^ "Voice of the Boro Ali Brownlee of BBC Tees dies". BBC News. 15 February 2016. Retrieved 15 February 2016. ^ Staff writer. "Vic Reeves' House Arrest". bbc.co.uk. BBC Radio 2 Comedy. ^ Staff writer. "Reeves enjoys a Big Day Out with apprentices". The Journal. Trinity Mirror. Retrieved 28 February 2008. ^ "Vic and Bob cancel live shows". Giggle Beats. Retrieved 18 January 2017. ^ "BBC pulls controversial Popetown". News story. 23 September 2004. Retrieved 29 June 2010. ^ "Mortimer & Whitehouse: Gone Fishing". BBC. ^ "Bob Mortimer on Desert Island Discs". BBC. 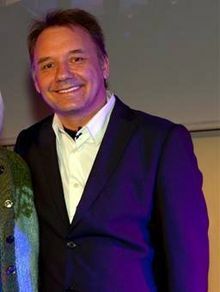 ^ "Bob Mortimer – my battle with arthritis". Magazine column. original: Radio Times "My Kind of Day" column, reproduction: bbc.co.uk Press Office. Retrieved 24 October 2007. ^ Press Association (27 October 2015). "Bob Mortimer cancels tour after triple heart bypass operation". The Guardian. Guardian Media Group. Retrieved 31 October 2015. ^ Jamieson, Sophie (13 January 2016). "Bob Mortimer wed long-term girlfriend just half an hour before life-saving heart bypass". The Daily Telegraph. Telegraph Media Group. Retrieved 7 July 2018.